This weekend I’ve taken part in the Big Night In competition run by Money Supermarket where we were given £50 to spend in order to enjoy our evening. 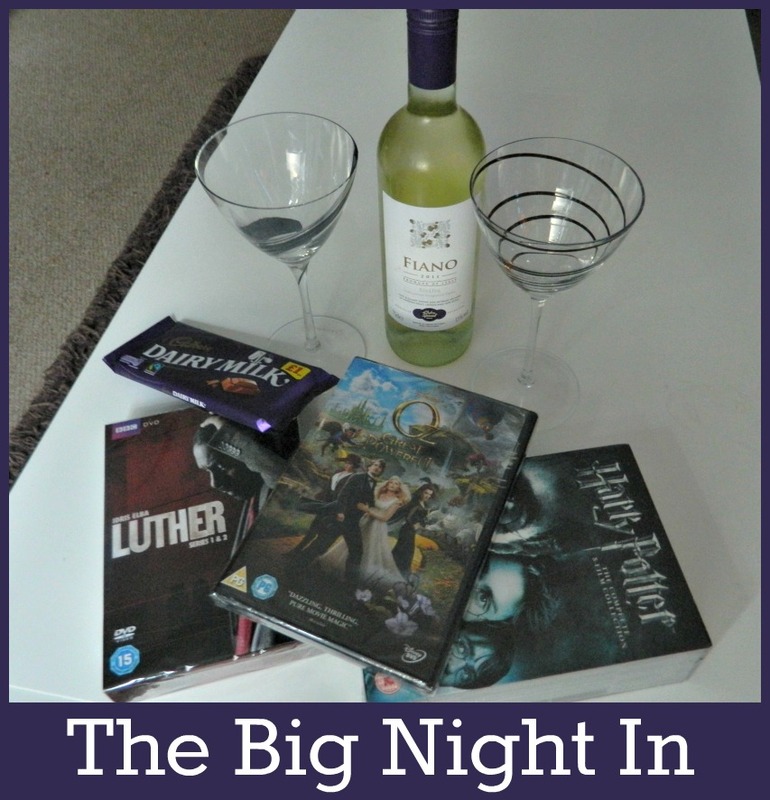 I have to say a Big Night in is way more common these days than a Big Night out, so we had a pretty good idea of the things we would enjoy. As you can see from my image, pretty much all of the money was spent on films. We are huge film fans and really enjoy trips to the cinema as a family as well as on our own. So what about our choices? Well ‘The Powerful Oz’ was a popular choice for all of us and one that’s just become available. We love crime dramas and I’d heard brilliant things about Luther although we’d never managed to catch an episode. I love the delight of being able to watch a whole series back to back to this was a good opportunity to grab Seasons 1 and 2 on the box set. And then finally we have Harry Potter – all 8 films. You’ll be surprised to know we’ve not see these films! We’ve not read the books either – shock horror!! But, Miss E has just ploughed her way through the first 3 books and I thought it would be a lovely thing for her to see the films, with us of course. So after Miss R had gone to bed, the adults enjoyed a glass of wine whilst we shared the chocolate and The Philospher’s Stone. We’re on holiday in a month or so and we love to take films with us for the quiet evenings when the children have gone to bed. I think we may well save Luther until then and make the most of being outdoors whilst this warm weather lasts. I spent £47 on DVD’s from Amazon and £1 on chocolate from our local shop. The wine was a gift from Britmums! I can’t get over you’ve not seen HP, loce the books and the films! I think you spent your £50 very wisely! Hehe. Indeed. Not my thing though and still isn’t tbh, but the others enjoyed! I can’t get over you’ve not seen HP, love the books and the films! I think you spent your £50 very wisely!